Ok I am trying not to complain but I do miss my dry kitchen. I fell in love with my previous apartment because it had both a dry and a wet kitchen. My happy zone was the dry kitchen island where I could potter around, baking, cooking and generally make a happy mess all my myself. Helper D had full reign of the wet kitchen where she did most of our heavy Chinese style cooking. The apartment I’m in now has some great advantages like a great view and location, but the kitchen, sadly, is pretty much like a ship’s galley – tiny, compact and too small to swing a cat around in. I did spend quite a lot of time researching how to make small spaces work in the kitchen, but it was pretty discouraging seeing interior decoration magazines where the pictures of what were deemed as small spaces look just about twice the size of my kitchen! And because we are not really planning on staying in this apartment in the long run, I had to restrain my OCD urge to rip out the whole kitchen and do a complete makeover and just live with what it came with. But just about the week before we were due to move in, I confess I terrorized my contractor by asking him to change all the old and oil encrusted kitchen cabinets. The man who as amazing and his equally awesome carpenter were so accommodating and they got the kitchen done in 5 days flat, working overnight to build in the cabinets and fit new drawers in. Of course they charged me for it, but I think I would have been even more miserable if I had not made this last minute decision. So at least I got a clean white kitchen that looks a little brighter and slightly less claustrophobic than it used to, and the cleaning would be so much easier than if we had kept the original kitchen. This phase of adjustment is, despite the renovation, a little unsettling – discovering that the burners on the stove are too high (I don’t think I can ever do a low simmer on this stove!!!) and the hood is completely ineffectual. And boy, is it hot to cook in that kitchen. But truth to tell I don’t know why I am complaining. There was a long phase of my life when I lived in rented apartments and I am no stranger to small kitchens. In fact, I remember a tiny apartment in Hillview Heights where when we first moved in, there was only one functional toilet available for 7 people, and one had to kind of wade through water in the bathroom because of constant leaks. And the kitchen in that apartment! The sink was sinking through the softening kitchen cabinets that could not hold it up, and the oven faithfully provided heat only at one corner of the oven. Ah…happy days. So I guess it’s not about the conditions – I certainly have been through worse…I just need to get used to a different place and style of doing things. Regardless, similar to my previous place, I still have groups of people tromping through regularly and I had to get used to cooking in the kitchen fast. So for my most recent mentoring group session I decided to make use of the Instant Pot to make a breakfast noodle soup. The Instant Pot is my one constant and it’s been a reliable pal in the kitchen. 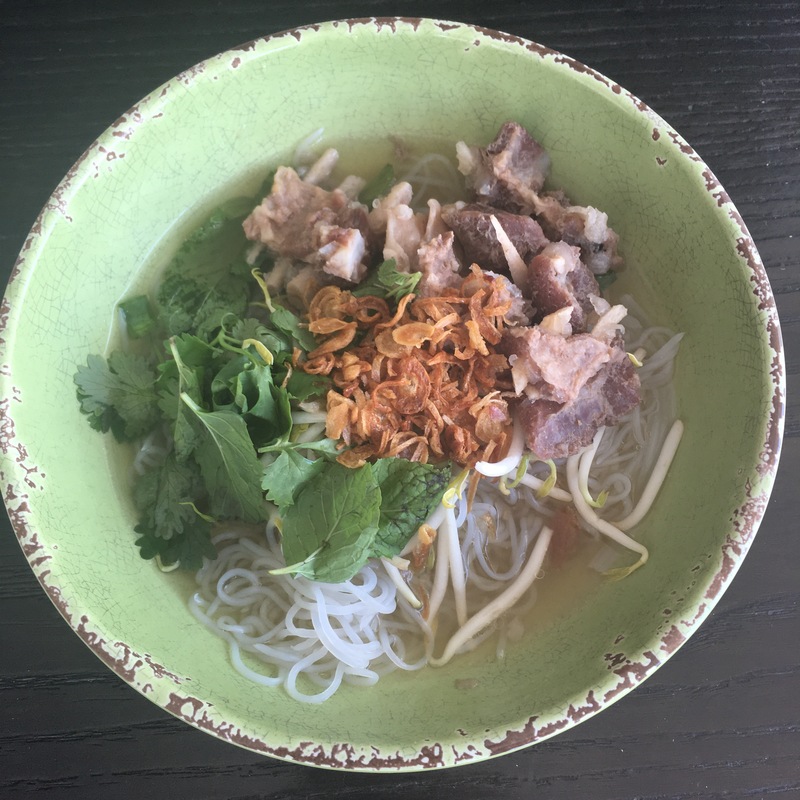 This recipe is Vietnamese inspired and uses pork instead of beef to make a kind of pho. It does need forward planning to marinate the pork beforehand, but this literally took only an hour or so to prepare, so I was well able to potter around the house doing other things while the Instant Pot strutted it’s stuff. So here is a comforting pork rib noodle soup recipe; and an easy cook for a crowd of people. Mix the minced onion and garlic, fish sauce and soy sauce, ground white pepper, salt and sugar substitute in a bowl. Add to the pork ribs and marinate overnight. Grill the whole dried cuttlefish over a nonstick pan for about 5 minutes. Add the pork, cuttlefish, peppercorns and water to the Instant Pot. Seal the pot and put on manual high pressure for 45 minutes and allow natural pressure release. When done, skim off any scum and remove the cuttlefish pieces. Prepare the shirataki noodles by draining the fluid and rinsing off the noodles. In a dry non-stick pan, gently dry fry the noodles till the excess fluid has evaporated, then set aside. In each bowl, place a portion of Shirataki noodles and bean sprouts, and ladle the hot soup over the noodles. Top with spring onions, mint and coriander leaves, fried shallots and garlic and serve hot. My cooker hob burners also suffer from only being able to be on high (there is no such thing as medium flame and the low flame tends to blow out). Hence, stove top pressure cookers are a no go so I am loving my Instant Pot! Anyway, I found out that the problem is type of gas supply! For some reason, LPG has this problem while town gas (Piped gas) does not. So, no luck for me until I move or switch to all induction!